Here you go guys, how great is this: BODYCOMBAT 58 review number two! Anyway – thanks so much to both my guest bloggers you guys went above and beyond the call of duty. And I’m happy to announce I even get to write the review on BODYCOMBAT 59 myself as I’ll be in Sweden for Super Saturday in September! Woo hoo! But first thing’s first: Take it away Rai-Rai! I’ll be honest, I tend to avoid filmings these days – the only reason why I attend is to support friends who are presenting, and in this instance, I attended BODYCOMBAT 58 due to my AIM2 trainer/friend Carrie Kepple being onstage as one of the EPIC team. I just wish she had a mic! Before I get going into the review of the release, Carrie, I just want to say that you are AMAZING and I loved seeing you up there – I know it meant a lot to you, and I am sure it will not be the last time we get to see you. Before I get into talking about the release itself, firstly, let me go over the filming experience. I’ve been to a few, being an Auckland resident, but recently there seems to have been changes. Firstly, when I stumbled up to the gym at 6:45am, I was staggered by the line of people that was trailing out of Studio 1. 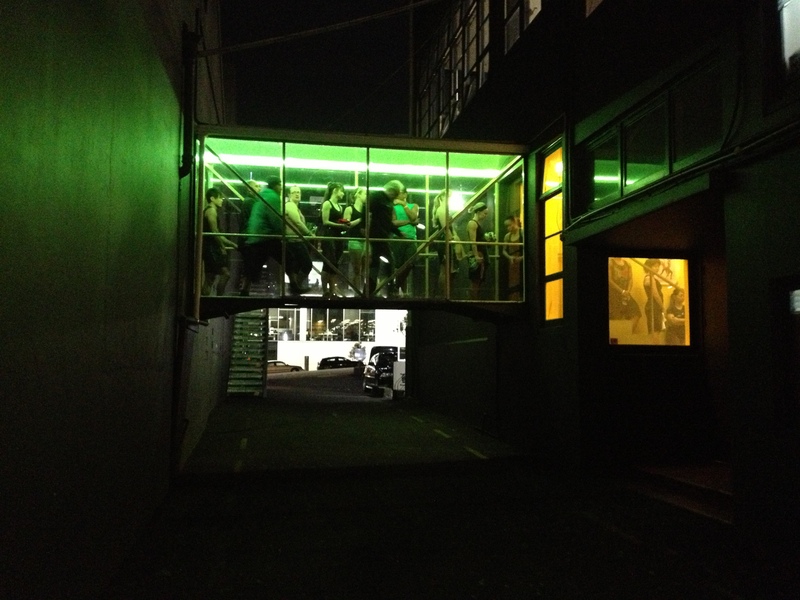 It looped down past Studio 1, Studio 2, past the changing rooms, over the bridge that connects the two buildings at LM Auckland, and down into the main gym area. That be a long queue! Regular members of the gym were walking past the queue, completely bewildered as to what these idiots were lining up for, haha! I was right at the back, with a few concerned people who were very worried that there wouldn’t be any space, but there was *more* than enough space for everyone, so there was no reason to worry. One thing I will say, and this was covered in Zhengjie’s review as well, there was a bit of confusion about positions in the front. Pete Manuel said over the mic several times that members of the LMI production crew *would* be moving people around and to expect to be moved if you were in the front few rows, but at that time of the morning it might have come out sounding a bit like wahp wahp wahp wahp, never mind language barriers and all of that. That being said… once everyone had been arranged… it was one of the least stressful BODYCOMBAT filmings I’ve ever been to! Normally I will get irritated at a filming due to all of the pushing and shoving (BODYCOMBAT and BODYATTACK are chronic for this sort of thing as your position is not fixed on the floor), though this time, everyone had their space, everyone respected their space, and for the most part of it, everyone had room to execute the moves safely. I say ‘for the most part’ as I was lucky enough to have a guy in front of me that would jump backwards every time we were supposed to move forwards. Bless his heart. TRACK 1A – Oh how I love thee! This track embodies in my opinion, the perfect upper body warmup. Modern, upbeat, fun, and with ample space in the music to cue and introduce each of the moves correctly. I don’t believe in complex combinations in the warm up, I believe the warm up should 1) warm you up, obviously, 2) teach you the moves and 3) elevate the mood. This track ticks all three of those. Also! There is a little dubstep interlude. *squee* I hear you now, “ What???? Dubstep you say?! I hate it immediately.” Seriously, the little bit they have in there is a WICKED contrast, and I feel that using dubstep *this* way is a great way to get people used to the sound. TRACK 2 – David from France presented this track, and let me just say this… I observed him in team teaches during the week and he struggled with the odd timing of the first combo. Due to no doubt a lot of hard work and practice, he NAILED the timing at the filming. The timing is odd though, and it takes a while to get used to. I LOVE the tune – though I am biased, if EDM were a human being, I’d marry it. It’s aggressive, dark, full of contrast, has lots of anticipation and build up, and very modern sounding. It’s not as aggressive on the musical palate as First Of The Year, so if you are worried about members not being used to the sound, this one is easier to digest, and they’ll probably be too distracted over how much their quads are hurting anyway! TRACK 3 – Zhengjie mentioned in his review that his pet peeve is when songs are recycled. I’m not a fan either *when* the sound is similar. For me, the tune that is used here, while recycled, is AWESOME, and is different enough sounding that you can continue to use the original track as well. Think of the difference between No Good (38) and Don’ t Need (49). Same melody, but different sound, and different training. I really like this one, it does the job, gets the heartrate up, is fun. 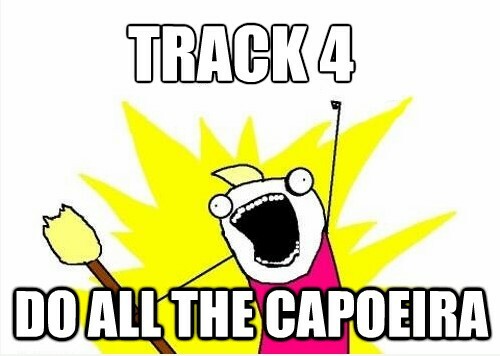 TRACK 4 – Time to do ALL the capoeira. The first time I saw this track, I was like “OMG I’m in love.” The second time I saw it, I went “… the music changed? !” I talked to Carrie after a team teach and she said that they weren’t able to acquire the worldwide rights to it, so had to do a last minute switch to another song, with the same choreography. The timing was slightly different even though the chorey between both tracks was the same. Giovanni did a really good job of adjusting to the new rhythm in the short space of time, so well done. This track is going to KILL your legs! TRACK 5 – My favourite of the release. It’s a recycled track, but the sound is so different between this and the release it was originally used in that you could continue to keep both in your library, and in your mixes. Daniel from the Netherlands presented this, and while he did a good job at filming, I actually want to draw attention to a moment in one of the team teaches that I was inspired by. The first team teach I attended, the microphone was absolutely murdered. What do I do when I don’t have a mic? Screech as loud as I can. But I don’t need to teach in Studio 1 to 100+ people. The way that he managed to precue every combo, every move using non-verbals, man! Totally inspiring. I know there was a BODYATTACK ed session a while back where Nathan Jones(?) demonstrated how to teach a track non verbally, I think having one for BODYCOMBAT would be a great idea. I have no doubt it would show most of the techniques that Daniel used that day. TRACK 6 – The first time I saw track 5, I was like “YAY we don’t have a lame, cheesy track 5! It’s all going to be good stuff from here.” Then track 6 began and I went “… what the hell is this?? ?” I’m not a fan of the song, but I understand why it’s in there, and I tell you what, over the course of the week, it grew on me BIG time. By filming, I liked it. This track is completely different from everything else in the release – every other track has a dark edge, a thumping beat, and a throbbing bassline. Even the upbeat upper body warmup has that dubstep interlude which adds darkness to it. This one is all rock, and all fun. Plus, you get the bonus of UK presenter Dave Cross. This guy is pure class and I hope that he comes back and presents again. WOW. He basically presents an AIM2 masterclass in a matter of minutes. Every time he taught, I was blown away. TRACK 9 – Nothing complicated or unachievable here, good tune, and a strong focus on the core. Dan’s doing awesome work in CXWORX, and I think that shows here too. I know that when I participate, the last thing I want to do after blasting my shoulders in T8 is more shoulder/chest work via push-ups/planks/etc. I tend to just sit there and look grumpy instead. This has been recognised, and there is a moment given for your shoulders to recover while the muscle focus is shifted elsewhere for a bit. Massive thumbs up from me. TRACK 10 – This cooldown is seriously amazing. I don’t think there was a cooldown that was as ‘meant for’ BODYCOMBAT as this one. Cooldowns don’t need to be soft rock – they don’t need to be Bruno Mars, or Bon Jovi, or whatever. The tune maintains that dark edge that is present throughout the release (sans T6), and the moves meld so perfectly with the melody that it takes your breath away. Overall, a very good release. I actually stopped participating in BODYCOMBAT for a good period of time due to favourite instructors of mine moving to different countries, and had no real interest in doing it again. This release makes me want to start doing it again. Dan and Rach, you’ve done a really good job with this release, I’m really looking forward to when the rest of the world gets to see it. 14 Responses to "BODYCOMBAT 58 review #2"
I have to agree this is an epic release and bring from the UK I had to be there to support Dave who did my initial training 3 years ago! He ripped it up and smashed it out! What an amazing guy! Your all gonna love it! I think I can see you in the photo! Awesome reviews from both of you. Can’t wait to see 58, I’m glad it’s better than 57! So is the Muay Thai another rock track? Glad that there is some crowd control happening as there was almost a fist fight between 2 of the ladies in the front row during filming for 57 – it was crazy!! Although one thing I have to say I don’t agree with is the placement of Auckland city instructors/presenters in spots where your average Joe who’s come from far far away was standing and has now been bumped a bit further back. First in -first served I say and just pray that there isn’t a large team there from one particular country. T7 is techno song with powerful and smashing lyrics from an classic rap-fight-song 😉 Loving also the release and think the team was really good overally, did 5 trial classes + filmings. My first time at the filmings.. such a great experience! See you Glen at SS! Woo hoo see you then! Just wondering if I can get some advice? I’ve come from Australia and want to go to the filming for BP – it is my first time coming to Auckland/ filmings. The BP filming is 7am Monday…. In your experience, what time do you recommend for me to be at the gym? Depends if you want to be at the front Arthur, those that want to be at front of class start queuing before 5am. I’d definitely get there around 6 otherwise. Enjoy! It was a pleasure to do your class this morning Glen :). Great great energy! And great reviews from both reviewers; looking forward to 58! See you & Stacy in Sweden in 2 weeks! Great to have you in class Mohammad! See you again soon! When will they give that girl a mic?!?!! I don’t remember which track it was, but there is one where she is standing right next to Dan, and I couldn’t have said who looks like they’re throwing the harder punshes. I think we all have female participants who start out with their girlie way of combatting, and we as instructors always get excited when they start learning to deliver more power into their blows… compared to Carrie, even some of the boys on stage, definetely all the other girls (possibly including Rachel) couldn’t compare. So again, give that girl a mic! I TOTALLY agree with you! She’s shadowing again for BC60, but I wish they would give her a mic!